A Neptune-size planet beyond the solar system has telltale traces of water vapor in its atmosphere, making it the smallest exoplanet known to have the wet stuff yet, scientists say. Several massive Jupiter-size giants have had the components of their atmosphere examined, but until now, the atmospheres of smaller planets have proved more elusive. In this new study, scientists discovered traces of water on the alien planet HAT-P-11b, which orbits a star 124 light-years from Earth in the constellation Cygnus. "Detecting it is both a confirmation of our theories and revealing for the bulk of the spectrum that we can observe," Fraine told Space.com. This image from the Hubble Space Telescope shows the star HAT-P-11 (center), which has a Neptune-size planet that is the smallest yet known to have water in its atmosphere. The planet, HAT-P-11b, is not visible in this image. The other bright object seen here is another star. For HAT-P-11b, a planet roughly four times the radius of Earth, that makeup is 90 percent hydrogen, with traces of water vapor. The Neptune-size planet orbits its sun every five days, at a distance that is only one-twentieth of the Earth-sun distance (which is 93 million miles, or 150 million kilometers). As a result, the temperature climbs higher on HAT P-11b than it does on gas giants in the solar system, reaching a sizzling 1,120 degrees Fahrenheit (605 degrees Celsius). Scientists have been studying the atmospheres of Jupiter-like planets for years, but smaller planets produce a smaller signal that is more challenging to observe. For the new study, researchers examined the atmospheres of four other smaller exoplanets — two roughly the size of Neptune and two smaller super-Earths — but the results were disappointingly featureless. "We do indeed have the technology — the resolution — to observe Neptune-size exoplanets, and even super-Earths," Fraine said. But the chemical compositions of the other four planets were blocked by a familiar phenomenon — clouds. "We've just been seeing a whole lot of nothing," Eliza Kempton, of Grinnell College in Iowa. Kempton models planetary atmospheres but was not involved in the research. This artist's illustration shows what the skies may look like on different alien planets. On the left is a cloudy planet, while on the right is a planet with clear skies that may resemble the sky of exoplanet HAT-P-11b, a Neptune-size world thought to have water in its atmosphere. Kempton added that the flat, featureless signals observed for the other planets were attributed to clouds or hazes in the upper atmosphere. The high clouds blocked light from the star, keeping it from penetrating through to the observers' side of the planet and leaving scientists unable to characterize the chemicals in the atmosphere. "It's not crazy to think that there should be clouds in these exoplanet atmospheres, because we see clouds in all the planetary atmospheres in our solar system," Kempton said. Although the hot, Neptune-size planet lives in a different environment from the icy giants in the solar system, it is similar to one of the four smaller planets whose atmosphere had already been studied. Those planets are known as GJ436b, GJ1214b, HD97658b and GJ3470b. HAT-P-11b is only slightly larger and warmer than the alien planet GJ436b, making them good to compare to one another because one has clouds and one does not, Fraine said. "I like to consider them the bigger version of the Earth-Venus twin pair," Fraine said of the planets HAT-P-11b and GJ436b. "They are basically the same mass, radius and temperature, but small changes in the formation, or even these bulk properties, may be causing vast changes in the atmospheric composition." The research is detailed in the Sept. 25 issue of the journal Nature, along with a commentary article by Kempton. In addition to learning more about the atmospheres of exoplanets as they appear today, scientists can also use HAT P-11b to understand more about the planet's interior and its formation. A planet's upper atmosphere results from what happens both above and below it. The balancing act involves irradiation from its star and from cosmic rays on the outside, as well as the chemical and dynamical systems lower in the atmosphere, Fraine explained. "If we know the input from above — the host star — and the upper atmosphere from our observations, then the missing piece of the puzzle is the interior composition," he said. Although the interior of a planet is complex, Fraine called the newly characterized atmosphere "a great step forward in solving the puzzle." The composition of the small planet's atmosphere also supports the core accretion model of planetary formation, where smaller particles combine to create larger and larger particles, eventually reaching planet-size proportions. "Core accretion predicts that planets are built from the inside out," Fraine said. "Measuring that HAT P-11b likely has a relatively hydrogen-poor atmosphere implies that it was formed from rocky material that later acquired a thick atmosphere above it, which is what the core-accretion model predicts." Had the planet formed along the lines of the competing gravitational instability model, its composition and that of its atmosphere should bear a stronger similarity to its star than what was measured by scientists. 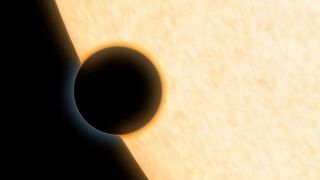 Because of its crucial role in the balancing act, the water vapor detected in the exoplanet's atmosphere played an important part in modeling its formation and evolution. "In the long run, if we can detect water, methane, carbon monoxide, carbon dioxide, etc., in dozens to hundreds of exoplanet atmospheres of various bulk properties, then we will be able to paint a much clearer picture of how planets form, and, likewise, how Earth formed," Fraine said. "This was just one of the beginning brush strokes to painting the full picture of how planets, as well as ourselves, were formed."